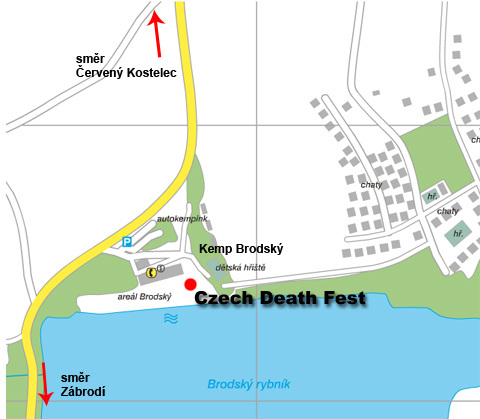 Professional sound, lights and stage are will be provided for Czech Death Fest. Free place for own tents in the area of camp Brodsky. Accommodation in 4-bed to 6-bed cabins in the area of camp possible. Cabins have to be booked on the phone No. +420 777 839 805 or on info@czechdeathfest.cz. The price is 1800,- CZK per cabin for the duration of the festival. Free parking in the area of the camp Brodsky. There is a beach and a possibility of bathing in the natural lake Brodsky right in the area of the festival - ATTENTION: BATHING AT YOUR OWN RISK! There will be an exchange office, various refreshments, tattoo studio and sale booths wtih CDs, DVDs, T-shirts, sweatshirts and other goods all available in the area. You can use the interactive map to plan your route. After clicking the blue flag you will be able to enter the data needed for planning the route. You can slide, zoom in or zoom out the map.